For years, San Francisco's iconic Golden Gate Bridge was a deathtrap. Cars would zip past one another at 65 MPH, separated by a thin line of yellow traffic cones, and head-on collisions were routine. However, a new barrier system—laid by a massive vehicle known as a Zipper Truck—will keep passing drivers from landing in each other's laps. The current traffic separators on the GG Bridge are a series of 19-inch-tall yellow rubber tubes, hand-placed by Caltrans workers every 25 feet along the span. Now, as anyone that has plowed through a traffic cone can tell you, they don't do much to impede any vehicle bigger than a moped. That's why, following a rash of head-on crashes in 1996, the Golden Gate Bridge Authority began designing a Jersey Barrier system to protect the opposite-bound lanes of Highway 1. The barrier blocks themselves measure 32 inches tall, a foot wide, weigh close to 1,500 pounds apiece, and connect to form an uninterrupted 13,340-foot long concrete barrier. 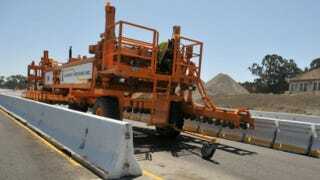 Depending on traffic conditions—southbound lanes are clogged for the AM commute, northbound lanes in the evening—Caltrans will rely on a tool known as a Zipper Truck to pick up and move the barrier between lanes, easing congestion. This process is actually easier said than done. Each 30-ton, 58-foot Zipper Truck is driven by a two-person team. As it passes over the barrier system, a series of wheels gently lifts each block off the street, funnels it through an S-shaped curve under the vehicle, and deposits the block into the other lane. The entire bridge-rearranging process should take less than ten minutes. When it is completed in the fall of 2013, the $26.5 million project will integrate with the zipper system already installed along the new Doyle Drive, to create a seamless, safe approach to the Golden Gate. "The movable barrier will completely eliminate the crossover head-on accidents," Mary Currie, public spokeswoman for the Golden Gate Bridge Authority, told Gizmodo. "Not all of the fatalities that have happened on the bridge have been [head-on's], but a majority of them have."